The 9 Best Public Golf Courses in Kentucky! You don’t have to take a trip to Scotland to play on greens that look like the Emerald Isle. Nevel Meade Golf Course in Prospect, Kentucky, is almost as good as being there. You’ll get a solid challenge when you face these rolling hills and deep bunkers, no matter at what skill level you play. You don’t have to be a member to play there, but membership has its perks, like longer tee-time privileges, handicap services, a 15 percent discount on items from the pro shop, and use of the members-only lounge. Everyone can use the driving range and putting green to improve their game. Young golfers are welcome, too, and can sign up for scrambles and the PGA Junior League team. Anything but ordinary, Cherry Blossom Golf Club in Georgetown, Kentucky has been named the #1 Public Golf Course in the state by Golfweek Magazine for seven years. This beautiful 18-hole course offers nearly 7,000 yards of golf and has a course rating of 73.9. Since its opening in 2001, Cherry Blossom Golf Club has a year-round driving range, paved cart paths, knowledgeable and friendly staff, and a manicured fairway that’s a treat to play. Need help to conquer the sand traps, water hazards, and improve your game? Lessons are available for any skill level. Membership includes invitations to all social events, the restaurant and bar, swimming pool, and access to Longview Golf Club at no additional cost. With just over 6,200 yards to play, A.J. Jolly Golf Course is a good course for the money. Located in Alexandria, Kentucky, A.J. Jolly is one of the top golf courses in the state, according to Golf Advisor and Golf Digest. One of the state’s best kept secrets, this 18-hole course opened in 1962 and prides itself on taking a unique approach to all those who come there. Each hold is demanding and rewarding, and you’ll have your work cut out for you when you play this course. Private lessons are available for those who want them, season passes can be purchased, and fun events like a couples tournament are planned on a regular basis. Ever want to play on a championship course? You can have your chance when you call for a tee time at Heritage Hill Golf Club in Shepherdsville, Kentucky. Multiple award winner, Heritage Hill gives you the change to play golf like it should be played. Designed to offer challenge and fun, this course has trees, tees, and fairways that give you slope and test your skill. The perfect place for your next golf outing, Heritage Hills has plenty of tee times and is a great deal for the money. Designed by two of the best course architects around, Kearney Hill Golf Course in Lexington, Kentucky is considered one of the premier places to play. The Scottish-style layout of the course gives you the challenge of deep sand pits, grassy bunkers, and rolling hills to master. A unique feature of this course is that it’s a Certified Audubon Cooperative Sanctuary dedicated to protect the birds and their habitat that live in the area. Several discounts are available: juniors, seniors (57+), students, disabled, and military. You’ll understand why Kentucky is called the bluegrass state when you gaze over the well-maintained greens of Lassing Pointe Golf Course. Located in the northern part of the state in Union, it’s just a short day trip from surrounding areas, and a favorite course to play. Whether you’re a seasoned player looking for a challenge or just love the game and being outside, you’ll find exceptional fairways and greens. And if you need a little extra help, stop by the pro shop and sign up for a quick lesson, or spend a little time at the driving range or practice putting green. Membership and season passes are available, and carts can be rented at the pro shop. Nothing epitomizes Southern grace and culture than a trip to the place that inspired “My Old Kentucky Home” by Stephen Foster. One of the most visited historic sites in this part of the state, My Old Kentucky Home Golf Course is in Bardstown. Opened to the public in 1933, the course and grounds were completely reconstructed and improved, earning it Golf Digest’s “Best Places to Play.” Besides a challenging course for beginners and advanced golfers, there are picnic areas, a playground and tennis court, and a gift shop and visitor’s center. You can save a significant amount on your game by purchasing a discount card. Another great golf course in an historic area of the state, Mineral Mound Golf Course in Eddyville, Kentucky was once home to the family of F. Scott Fitzgerald. With a front nine that feature uphill shots, the back nine takes you in and around the waters of Lake Barkley. After a great day playing this 18-hole par-72 course, you can relax by the water, take a boat out on the lake, or fish off the pier. Lakes, quality greens and fairways, and a renovated course make Paxton Park Golf Course in Paducah, Kentucky, one of the best golf destinations in the southwestern part of the state. 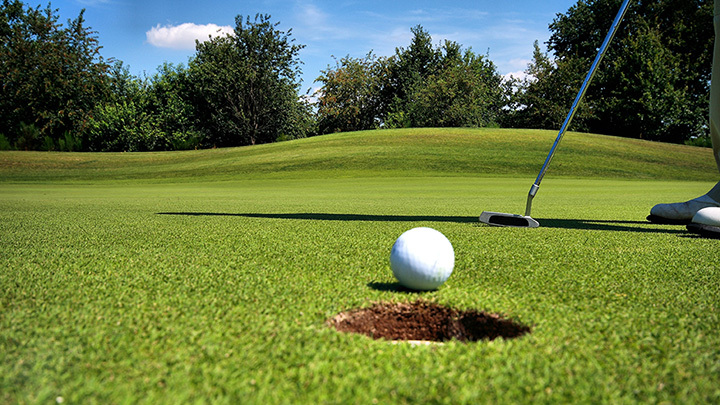 You’ll be at the top of your game with the well-maintained course featuring paved paths for carts, veteran and professional golf pros that will help you improve your strokes, special events, and several membership options designed to meet your budget. Family- and kid-friendly, Paxton Park serves as a host facility for developmental programs.